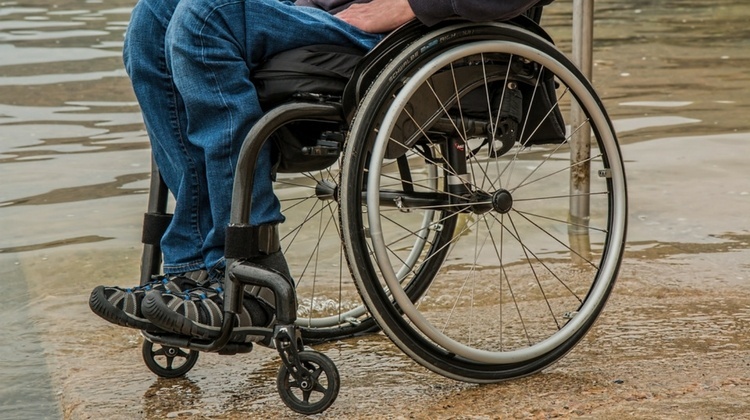 ​In this article, we short-list the top wheelchairs that are currently on the market. Our aim is to provide you with the essential information needed to decide which is the best wheelchair for your needs. How To Find The Right Transport Wheelchair For You? 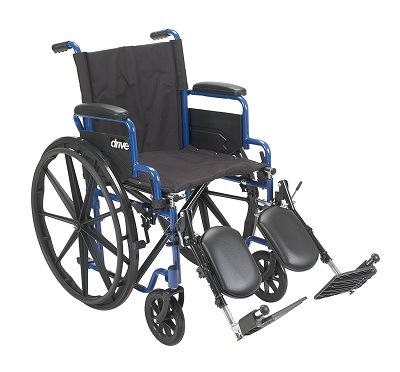 First on the list is the Drive Medical Lightweight Steel Transport Wheelchair, with Fixed Full Arms and 19” Seat. This product stands out because of its simple design, meant for light use. If you’re looking for a wheelchair for even terrain like malls, hospitals, and small parks, then this might be the wheelchair to consider. This wheelchair also comes with fully fixed arms that have padded armrests for additional comfort. The 19” seat makes it both comfortably spacious and just narrow enough to navigate sharp turns. The lightweight wheelchair comes with a fold- down backrest and has specially designed handles to be folded for easy storage and transport. Has a swing-away footrest for easy to get in and out. The wheelchair comes with rear wheel locks. The product weighs 26 lbs., and has a weight capacity of 250 lbs. The Drive Medical Fly Lite Ultra Lightweight Transport Wheelchair is compact and lightweight, designed for portability. 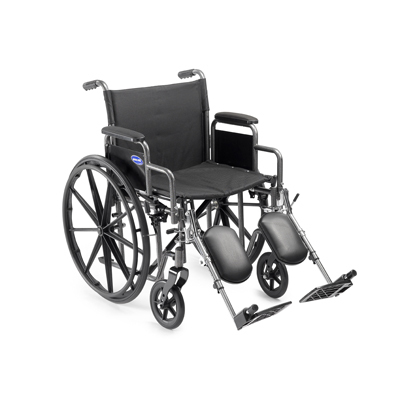 The wheelchair comes with 6 inch front wheels, 8 inch back wheels, and an ultra-lightweight frame. The chair is designed light and narrow for better manoeuvring. The back support also easily folds down for storage and transport. The ultra-lightweight aluminum frame makes it easy to manually fold and load the wheelchair into a car. The wheelchair has other features such as aluminum wheel locks. For greater comfort, the wheelchair comes with easy height-adjustable swing-away footrests. There’s also a handy carry pocket at the back of the chair. Because of its light frame and design, this wheelchair is meant to be used for lighter terrain and smoother environments, though the chair (19 inches seat width) still comes with a seat belt for safety. The wheelchair weighs 23.8 lbs. and can accommodate a weight capacity of 300 lbs. If comfort and higher manoeuvrability is what you’re looking for, consider the Self Transport Folding Wheelchair by MedMobile. This wheelchair has a heavy frame designed with adjustable accessories. One of the features for comfort of this wheelchair is the set of elevating and swing away detachable footrests. This is a helpful feature for users who want to reduce swelling and discomfort in the legs and feet. The wheelchair also comes with a detachable armrest, making it easier to roll under or closer to a table. The heavy frame of the wheelchair comes with enlarged 24” rear wheels, with soft-grip tires. For users who frequently go outdoors and through hilly terrain, this might be the wheelchair to consider. Weighing at 49 lbs., this heavy-duty wheelchair can carry up to a weight capacity of 250 lbs. 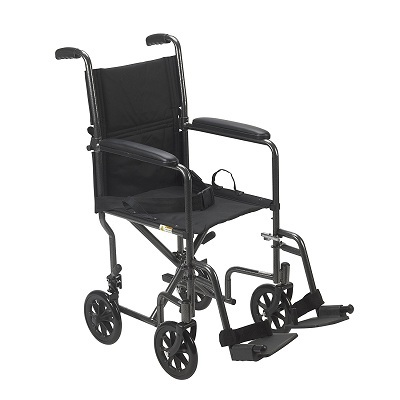 Another heavy frame wheelchair that’s one of our top pick is the MDS808210 ABE Aluminum Transport Chair by Medline. Designed with large 12” rear wheels, this wheelchair can overcome uneven outdoor surfaces smoothly. The product is fitted with a seatbelt for safety. Another great benefit is the loop-lock handbrakes on top of this wheelchair, making it easy for locking the rear wheels for transfers. With the powder-coated aluminium frame, this transport chain is both lightweight and durable. This aluminum frame wheelchair can also be easily transported due to its foldable back and detachable footrests. The product weighs 25 lbs. and has a weight capacity of 300 lbs. 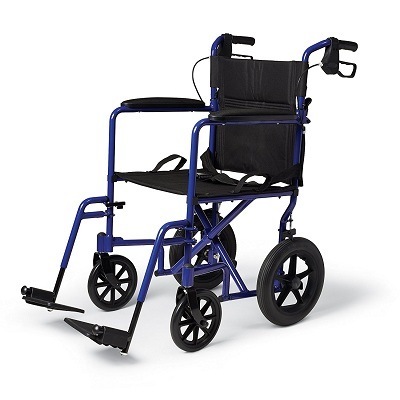 Last on this review roundup is the Drive Medical BLS20FBD-ELR Blue Streak Wheelchair. What makes this product stand out is its flip back desk arms designed for easier mobility, therefore very convenient to transfer to bed with these adjustable arm rests. For storage, it’s easier for users to fold, and roll this under a table. The product comes with solid rubber tires on composite wheels. Designed to be durable, the chair is also easy-to-clean and has low maintenance. The fully padded armrests add to the comfort of the user. This wheelchair also has easy to operate push to lock brakes. Its elevating leg rest function gives the convenience of easily slide in and out of your chair. This wheelchair weighs 41.2 lbs., and weighs 250 lbs. The right transport wheelchair can help you better enjoy the things you love to do; with greater mobility, you can go out and socialize more with friends and family. The top consideration for finding the right transport wheelchair is your needs. You need to make a basic assessment of your personal characteristics, the use and functionality you’re looking for, and other features for comfort and portability. Here are a few questions you can ask to help you narrow down your search. Do I need a heavy-duty wheelchair, or a lightweight-use wheelchair? One of the biggest differences you can easily spot between two different wheelchairs is their frame build and their wheel size. Lightweight chairs have smaller wheels and have lighter frames. They are usually designed for smoother terrain and limited time use. Heavy-duty wheelchairs, on the other hand, are designed with the outdoors in mind. They have larger rear wheels and heavier materials. You should consider how often you would be using the chair and in what places you’ll most likely be using them in. Know the proper use of the wheelchair to also avoid any accidents. Do I need a portable wheelchair? There are wheelchairs which prioritise portability as one of their features. These wheelchairs often come with backs that can fold down, stowaway armrests or detachable footrests. You should consider a portable wheelchair if you’ll be frequently transported by a car that can’t fit non-folding wheelchairs. A portable wheelchair is also popular with users who can walk for shorter distances and don’t need the wheelchair all the time. Some would carry a walking cane with them to use. Do you need an adjustable armrest, footrest and other features? You should also consider your own type of injury. Wheelchairs with adjustable footrests are ideal for users who need to elevate their legs and feet. Features such as back and neck support are essential for those with relevant medical conditions. An adjustable armrest is an added convenience for those who want to smoothly roll closer to a table. Make sure to know how to do maintenance checks﻿﻿ on your wheelchair by checking the manual or asking the manufacturer. There are other features you can consider, such as protection from sun and rain, and wheelchair storage bags. Always think about what you need before purchasing a wheelchair. This even includes your size and body type. n this review, considering comfort, portability and value for money, the Drive Medical Lightweight Steel Transport Wheelchair is the clear winner. 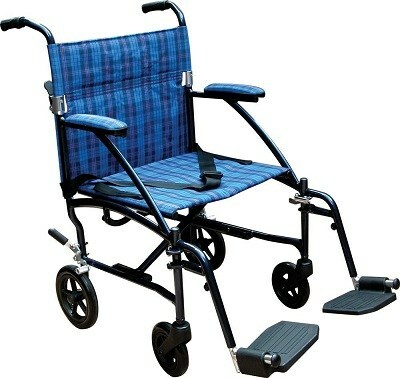 This manual wheelchair stood out from the rest with its great movability, easy portability, and features for comfort. Perfect for its light weight and use, this simple wheelchair is a fitting transport wheelchair for any user.